About a month ago I went to a really cool draw event over in the Wynwood distract of Miami. Tons of people, pens, and paper with everyone out sketching one another. There were some power players there like Brian Butler and Jose Mertz, but also lots of novices. The vibe was great (with no ego) and just a love for drawing from everyone. The entire thing was put together by the developers of the Sktchy app. I was impressed an event like this was happening right in my backyard. Over the course of the next few weeks I've gotten to play with the Sktchy app and also got to know the man behind it, Jordan Melnick. We shared some beers and discussed the incredible art community we both get to be a part of. 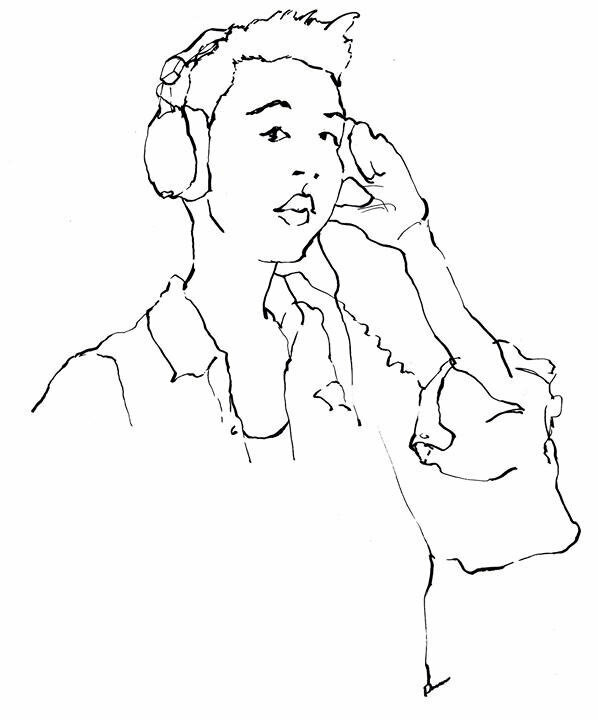 Sktchy really is a great tool, folks upload a photo of themselves and the community draws them. You can sketch, paint, doodle it however you'd like and then upload and share your rendition. I've been discovering some really great artists on there and asked Jordan if he'd like to host interviews with some of my favorites. Here's an exclusive Q&A between Jordan and one of those artists, Patrick Parks. Patrick creates portraits that reveal a flair for fashion, a confidence in color and an ability to express strong human emotion with just a few lines. In brief, what's your bio/background? I currently attend the Academy of Art University in San Francisco California. I started off as a visual merchandising major. Then I switched to fashion merchandising. 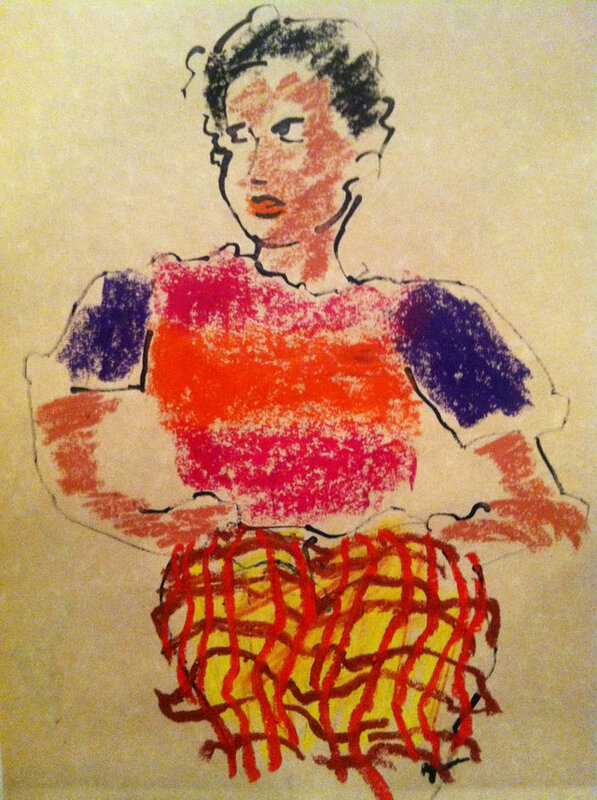 Then I switched again to fine arts drawing and painting because of a fashion illustration class I took my freshman year. How do you approach fashion illustration differently from other kinds of illustration? In a quick loose direct uninhibited manner. When you're looking for inspiration among the faces in the Sktchy photo gallery, what jumps out at you? At first I only liked to draw people who were in profile because I was rusty, and it's easier to see the contours in the face. Now I'm obsessed with men who have beards. What's your medium of choice when you're creating a portrait? Pen and watercolor. What's one quirk in your creative process? I prefer to draw naked. What living person inspires you more than anyone else? My mom would kill me if I didn't say her :) What person from the past inspires you more than anyone else? Martin Luther King junior...I mean come-on really? What's your favorite art-making music? The Sukh Knight station on Pandora. If you could spend an hour alone with one portrait in the universe, which would it be? Egon Schiele's "Sitting Woman with Legs Drawn Up". Please respond to this question with a doodle: Knock, knock. Who's there? 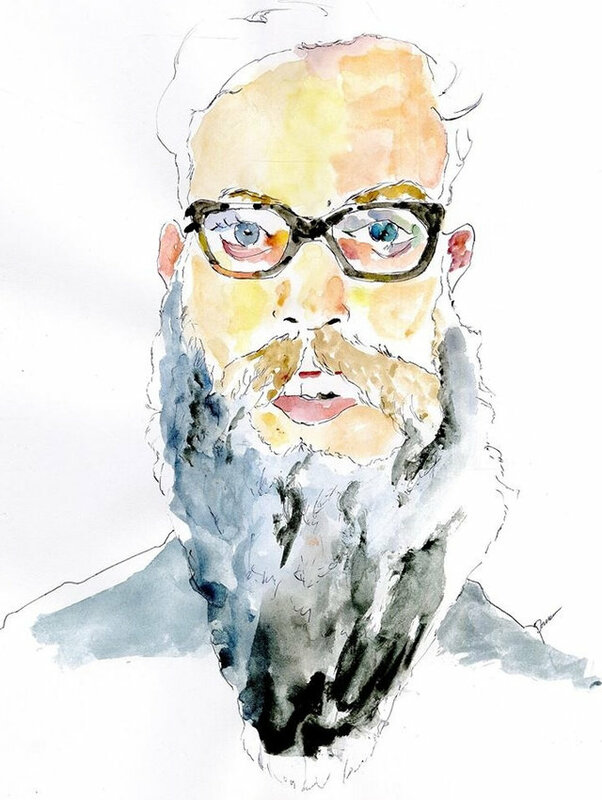 To view more of Patrick's portraits and the photos that inspired them, get the free Sktchy iPhone app from the App Store at sktchy.com/app.